Sepia toned photos are so beautiful!!! 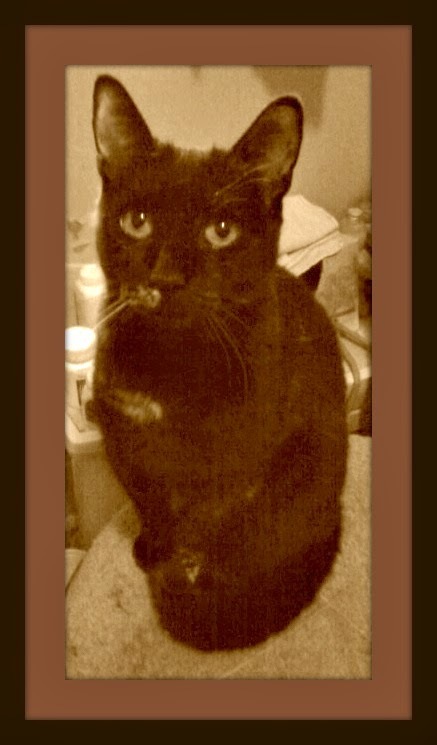 And Truffles, you are a purr-fect sepia kitty! You look so lovely in Sepia Truffles! Truffles, when Mom uses her iPad to take photos of us it isn't as good as her Nikon and she is so picky. But sometimes she gets us doing what she calls "adorable" things and like your Mom she will try to use some photo effects to make our picture look better. WE think you are so sweetly posed in this photo! Thanks for joining Ruckus The Eskie and Earl's World! 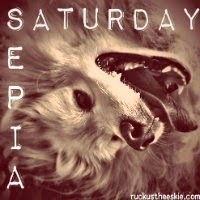 in Sepia Saturday! I think Mom should give you some privacy when you are on the toilet. Some of the Grainy ones comes out the best! Loves it! Well furstly we fink yous look just gawjus in da footo. But mommy hates da quality of da iPad fotos too. She sez they just ain't all dat but sumtimes they be all ya' have. Weez also twied da chicken pot pir. Weez didn't get a whole case, but mommy did find da chuncks was easily mashed up so yous not have to leave anyfin' in da plate. We think that picture came out great, Truffles. That's a really pretty art pic of you, Truffles!